Chevron's recruitment of academics to promote the oil giant's increasingly hapless attempts to defend its Ecuador pollution disaster appears to have compromised the ethics of two more professors at a prominent institution of higher learning. This time, the credibility blow handed out by Chevron is being suffered by New York University. We recently exposed how a Notre Dame human rights law professor, Douglas Cassel, was shilling on behalf of Chevron and compromising the academic integrity of his university without disclosing the extent of his relationship with the oil giant or the amount of money he was receiving. Since our expose appeared, Cassel has not written further about the Ecuador matter. What we know on the NYU front is that Professor Linda J. Silberman, an expert in transnational litigation who has been teaching at NYU School of Law since the 1980s, is using her post to quietly shadow block on behalf of Chevron to prevent long-suffering Ecuadorian rainforest villagers from recovering their $9.5 billion environmental judgment. Silberman's role in the litigation -- managed by the outside Chevron law firm Jones Day -- is part of a larger campaign by the company to evade accountability for the deliberate dumping of billions of gallons of toxic oil waste into the rainforest when it operated in Ecuador (under the Texaco brand) from 1964 to 1992. The facts of Chevron's reckless misconduct have been confirmed by three layers of courts in Ecuador, including by the country's Supreme Court in a unanimous 222-page decision issued in 2013. That decision meticulously documented extensive pollution that continues to contaminate groundwater and surface water at hundreds of former Chevron production sites covering a huge swath of rainforest that is home to five indigenous groups. A sixth group, the Tetete, disappeared shortly after Texaco arrived on the scene in the early 1960s. Chevron insisted the trial be held in Ecuador and repeatedly praised the country's court system to get the venue shifted out of the U.S.
Silberman's cameo role in this fiasco came to our attention recently when an unpublished essay she authored with an NYU colleague, Aaron Simowitz, arrived in our inbox. Available here, the essay was distributed to an internet community focused on "dispute management" in the energy sector. We were stunned to notice the complete absence of a proper conflict of interest disclosure in the essay by Silberman and her co-author explaining their ties to Chevron and its law firms in the Ecuador litigation. Both are clearly violating NYU's Code of Ethical Conduct, as we explain below. At the end of the essay, Silberman meekly notes she is a consultant to the Chevron law firm Jones Day. Really now. Jones Day has played a critical and highly controversial role fighting the indigenous groups with corrupt tactics -- including the use of bribes and the secret videotaping of a trial judge. Jones Day and its lead partner Tim Cullen have reaped millions of dollars in fees for so-called "services" that include paying the rent and laundry bills of a corrupt Chevron operative (Diego Borja) after he was spirited out of Ecuador to live under Chevron's protection in the United States. Clearly, the exact nature of the Jones Day relationship to Silberman might be something NYU's students and faculty need to know to be able to assess the credibility of her "scholarship" and teaching about the litigation. She might also mention how much Jones Day is paying her to lend her academic credibility as an NYU professor to Chevron's strategy to block the Ecuadorians from entering the courthouse in Canada, where they are trying to seize company assets to pay for their environmental remediation. The lack of disclosure in the Silberman/Simowitz essay is one problem. The intellectual dishonesty by these so-called scholars is another. In the article, Silberman and Simowitz claim that Canada's Supreme Court got it "wrong" when it ruled unanimously in September that the villagers have the right to try to seize Chevron's assets in that country to satisfy their judgment. The only reason the villagers are trying to seize those assets in Canada is because Chevron -- after 11 years of litigation in its preferred forum of Ecuador -- refuses to pay the judgment despite accepting jurisdiction there as a condition of moving the case out of New York in 2001. Chevron also sold off its assets in Ecuador during the trial as the evidence mounted against it, leaving those affected with almost no options to collect. Silberman and Simowitz fail to mention that Chevron announced years ago that it would fight the villagers "until hell freezes over" and then "skate it out on the ice." Once it became clear Ecuador's courts might actually hold the company accountable, Chevron's lawyers tried desperately to sabotage Ecuador's court process as we mentioned. The company played an abusive game of forum shopping and sued Ecuador's government in a secret arbitration proceeding that excluded the villagers to try to obtain a taxpayer-funded bailout of its pollution liability. Instead of explaining this critical context to their readers, the authors attack the Canada Supreme Court's decision on conclusory technical grounds by promoting a legal fiction created by Chevron. The authors repeat Chevron's losing argument before the Canada Court that it would impose a "substantial burden" to force an oil company with $250 billion in annual revenue to defend the Ecuador judgment in Canada because all of its assets there -- estimated to be worth $15 billion -- are held by a wholly-owned subsidiary. The Canada Supreme Court rejected this argument in very plain language by explaining Chevron does have assets in Canada via its subsidiary. While we believe the Chevron defense promoted by Silberman is preposterous -- any Chevron-owned subsidiary logically is a Chevron asset that can be used to pay off a Chevron debt -- at a minimum the oil giant's claim will be litigated in Canada now that the Court has ruled the case can proceed. Yet according to Silberman and Simowitz, this technical defense should block the enforcement action from even commencing. Given that Chevron operates around the world only through its subsidiaries, their argument is a stab at obtaining complete impunity for a corporate human rights abuser. While Silberman and Simowitz have a right to make an intellectually dishonest argument in support of Chevron's abusive litigation strategy, they don't have a right to make it without disclosing their conflicts of interest or otherwise ignoring their ethical obligations in violation of NYU's written Code of Ethical Conduct. NYU's ethics policy prevents conflicts of interest and requires all faculty to uphold the "highest professional and community ethical standards." We suggest Silberman disclose how much she is making for promoting Chevron's arguments, how long she has been on the Chevron dole, whether Jones Day passes on the costs of Silberman's work to Chevron, and so on. She should disclose whether lawyers at Chevron or Jones Day have the right to review her supposedly "independent" analyses before they are published or otherwise distributed. Her contract with Jones Day and communications with the law firm pertinent to the Chevron matter should be fully disclosed. The same goes for Simowitz and his relationships with Gibson Dunn or any other Chevron law firm. Again, we question whether these otherwise reputable professors would engage this issue in this way had they not been paid by Chevron or its surrogates. The issue of corporate corruption of academia has been a hot topic in recent weeks. The New York Times recently exposed how Monsanto pays academics to launder company agitprop to block the labeling of genetically modified foods. A major academic at the Brookings Institute recently lost his job after Sen. Elizabeth Warren nailed him for failing to disclose to Congress that his flawed research was funded by a pro-business lobbying group. Chevron has a long history in the Ecuador matter of trying to secretly pay academics in service of its litigation positions. The company has hired a global warming skeptic named Douglas Southgate, a former lobbyist for the chemical industry named Ralph Marquez, and a technical consultant named John Conner who wrote a field manual ordering company scientists to lift only "clean" soil samples during the Ecuador trial to hide contamination from the court. NYU's faculty needs to ensure that Silberman and Simowitz comply with the university's Code of Ethical Conduct. They should be prohibited from trying to hide partisan advocacy in the clothing of independent scholarship. Most of all, they should be barred from letting Chevron stealthily capitalize on NYU's good name to evade accountability for its abuses in the rainforest. We look forward to see whether NYU as an institution has the backbone to address the very obvious ethical lapses of two of its leading professors. Chevron CEO John Watson is the one person ultimately responsible for his company's refusal to abide by the rule of law and pay a $9.5 billion court judgment for toxic dumping in Ecuador's rainforest. But we cannot forget that another high-level Chevron executive currently in Watson's employ --Ricardo Reis Veiga -- did much of Chevron's corrupt "dirty work" in the South American nation and deserves to be held accountable for his leading role in the misconduct. The fact Watson continues to protect Reis Veiga reflects poorly not only on Watson's own lax ethical standards, but it also creates significant risk to company shareholders as we will see below. First day of Ecuador trial -- October 21, 2003: Chevron's Reis Veiga tries to explain the impossible while his Israeli bodyguard casts a wary eye from behind. Photo by Lou Dematteis. For years in the 1990s, Reis Veiga was known in Ecuador as the "architect" of the Chevron-Texaco fraud. As Texaco's main lawyer on the case, he was indicted after the villagers presented information about how he had "certified" a fake clean-up to to Ecuador's government in a desperate effort to help the company evade liability. Under pressure from Chevron, prosecutors dropped the criminal charges but the cold hard facts about Reis Veiga's corruption cannot so easily be erased. A lawyer and Brazilian national, Reis Veiga set in motion Chevron's disastrous Ecuador policy when in 1995 he negotiated a "remediation" agreement on behalf of Texaco with certain corrupt officials in the government. (Chevron bought Texaco in 2001 and assumed its liability in Ecuador.) The agreement allowed Texaco to go through the cosmetic motions of a clean-up while spending virtually no money to address the underlying environmental impacts. Those impacts include the abandonment of roughly 1,000 toxic waste pits filled with oil sludge and the dumping of billions of gallons of toxic "water of production" into streams and rivers relied on by local inhabitants for their drinking water. The more salient point is that Reis Veiga's "remediation" was shot through with fraud. Texaco spent only $40 million to address the massive contamination which included hundreds of equivalent U.S. Superfund sites. This is far less than a penny on the dollar of what a real clean-up would cost, according to the later court judgment and various independent analyses. Texaco also spent about one-tenth of one percent of the roughly $50 billion BP has allocated to its much smaller 2010 spill in the Gulf of Mexico. While Chevron now spends millions of dollars on ads claiming it supports the communities where it operates, Reis Veiga negotiated a deal to screw the affected communities of Ecuador. What had to surprise Chevron and Reis Veiga is that the trial in Ecuador over the company's dumping -- a trial that the company fought desperately to block -- actually happened. The indigenous communities had the wherewithal to hire lawyers and the funds to hire technical experts. Evidence against Chevron quickly started to mount. And as a result, a Chevron lie that already was visible to the naked eye in the oil fields was verified in laboratories as well. Scientific sampling data from field inspections during the trial in Ecuador showed exorbitant rates of cancer-causing petroleum hydrocarbons at sites Reis Veiga had claimed were cleaned. As an example, at Sacha 65 -- a former Chevron well site that Reis Veiga had certified as remediated to Ecuador's government back in 1998 -- a soil sample lifted during the trial had 35,380 ppm of petroleum hydrocarbons. That's more than 350 times higher than the maximum amount allowed in most U.S. states. It also exceeded Ecuador's regulatory norms by an order of magnitude. In fact, there were 54 separate sites supposed "remediated" under the Reis Veiga plan that were inspected during the later trial. All demonstrated the presence of harmful toxins and all but two were above Ecuadorian regulatory norms. Some exceeded the norms by dozens and even hundreds of multiples. By its own admission, Chevron applied its wholly inadequate clean-up methods to only a small portion of the waste pits it abandoned in Ecuador. Chevron simply excluded 85% of the pits from its flawed action plan altogether. Those pits were left to continue contaminating soils and drinking water for centuries absent compliance with the Ecuador court judgment. Even if one focuses only on the small fraction of waste pits Chevron took responsibility for under Reis Veiga's plan, many of those were left untouched on the theory they were being used by villagers for fishing. Others were left untouched based on a simple drive-by inspection that involved no actual soil testing. In actuality, all were filled with oil sludge. For the pits it did address, Chevron used heavy earth-moving equipment to cover up the sludge with dirt without cleaning out the toxins. Reis Veiga's plan was to bury evidence of the crime for the lowest possible cost. He never imagined these hidden pits would be unearthed by scientists working for the villagers during the later trial. For the communities in the affected region, Chevron's Potemkin clean-up actually made the matter worse. Many villagers moved next to the newly covered waste pits thinking Texaco must have been acting in good faith when it told locals it was remediating. That's just a sickening level of cruelty even for a company recently named the worst global corporation at a ceremony in Davos. Aside from the outright fraud in the design and execution of the Reis Veiga plan, the Chevron executive did nothing to address the separate impacts of the billions of gallons of benzene-laden water of production that were discharged into streams and rivers. Reis Veiga also ignored the need for medical care and monitoring to deal with skyrocketing rates of cancer and other oil-related diseases. The economic impacts also have gutted the communities. While Watson makes approximately $30 million per year in compensation, the average indigenous person in the Amazon is lucky to pull in $1,000. That's after Chevron robbed the communities of access to clean water and most of the other non-monetary riches found on rainforest ancestral lands. Reis Veiga's misconduct was not limited to the bogus remediation. 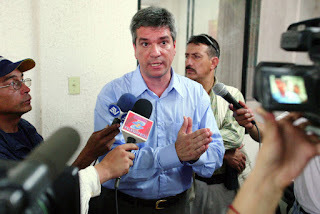 During the trial, he was heavily involved in the halting of a critical judicial inspection (see paragraphs 18 to 27 of the referenced document) by fabricating a security threat against Chevron lawyers. His fingerprints were all over the work of Chevron consultant John Connor when he wrote a field manual directing company scientists to lift soil samples only from "clean" spots far away from sources of pollution in an attempt to deceive the court. Given this outrageous and patently criminal conduct, why is Reis Veiga still employed at Chevron? The reality is that an oil company management team acting Mafi-style in Ecuador cannot afford to let its skeletons migrate out of the closet. This is the same company that recently employed the author of a legal memo (William J. Haynes) justifying the torture of detainees when he was an official at the Pentagon. Other egregious Chevron wrongdoers in the Ecuador matter, such as discredited witnesses Diego Borja and Alberto Guerra, are kept close with fat salaries, homes in gated communities on golf courses, stipends for spouses and family members, and all sorts of luxury perks such as first class air travel that are hidden from shareholders and the public. Then there are the academics who have humiliated themselves and compromised the integrity of their institutions by trying to defend Chevron's atrocities in Ecuador in exchange for money -- people such as Notre Dame Law Professor Douglas Cassel, Dr. Douglas Southgate of the climate change-denying Heartland Institute, and Dr. Pedro J. Alvarez of Rice University. Their involvement comes from the same dark place in Chevron's legal department where ethical rot has taken hold under the leadership of General Counsel R. Hewitt Pate, and where Reis Veiga hangs out. Chevron's Board of Directors -- notorious for its lack of independence given that Watson himself is Chairperson -- is letting an environmental liability turn into a major business problem. Company operations in Canada and elsewhere are under seige as the villagers try to collect on their judgment by targeting Chevron's assets. In Canada, the company has an estimated $15 billion worth of refineries, oil fields, office buildings, and intellectual property rights. Not to be glib, but we suspect the indigenous people of Ecuador are going to own a good chunk of that portfolio if the company does not abide by its legal obligations. We are still waiting for any sign that the Chevron Board will take the necessary steps to fulfill its fiduciary obligations. It might start much as BP did in the Gulf -- by immediately paying compensation to those affected. It might follow up by ordering an independent review of the legal violations involved -- including the possible bribery of foreign officials -- in the desperate attempts by high-level company officers and employees to extricate themselves from this problem. On behalf of Texaco and now Chevron, Reis Veiga executed a strategy in Ecuador of cover-up rather than clean-up. The disturbing facts are part of the plain history of Chevron's billion-dollar campaign to obtain impunity. As we predicted, Chevron's jurisdictional shell game to evade its legal obligations to the people of Ecuador has now hit the courts of Canada with full force. One might remember statements by various Chevron officials a few years ago that the company planned to fight the villagers it poisoned in Ecuador until "hell freezes over, and then skate it out on the ice." This blog describes one way the company tries to make it work in practice. That's the good news. The bad news is that the villagers and their counsel once again might have to jump through the same old hoops to convince yet another trial court not to fall prey to Chevron's shell game. These are the same hoops the villagers and their lawyers have been forced to navigate ad infinitum since their claims against Chevron were originally filed in 1993. For Chevron, the goal in this matter is simple: litigation in perpetuity. The company sold off its assets in Ecuador when it saw the evidence mount against it. The company clearly believes it is cheaper to fight the people it poisoned than to pay for a remediation of their ancestral lands and much-needed cancer treatment. Chevron clearly does not much care whether it loses any particular legal issue as long as its long-term strategy of delay remains viable. Chevron's Canada defense makes it clear that the company plans to coax Canadian courts into the trap of re-litigating numerous procedural and substantive issues already decided by courts in Ecuador in the country where Chevron insisted the trial be held. After vigorously fighting the case in Ecuador's courts for 11 years, Chevron now wants Canada's courts to let it re-litigate whether the company was subject to jurisdiction during that entire time. In its submission, Chevron conveniently fails to mention that it voluntarily stipulated to jurisdiction in Ecuador. Ecuador's courts already ruled against the company on this issue. Chevron knows this claim is a loser, but it will use it to try to buy months of delay if Canada's courts let it. Chevron also claims that a new statute in Ecuador which became law in 1999 (the Environmental Management Act) and was used by the villagers for procedural purposes was applied retroactively in violation of the country's Constitution. In fact, the substantive claims of the case against Chevron in Ecuador are based on a civil statute dating to 1861. Again, Chevron lost this issue in the courts of Ecuador. It is a certain loser in Canada, but of course that's not the point for the oil giant. In another attempt to muck up the Canadian proceeding, Chevron is asking the court to rule that the sham "remediation" it conducted in Ecuador in the mid-1990s that resulted in a release for the company from Ecuador's government should bar the private lawsuit of the villagers. Yet the villagers were not a party to the release and cannot be bound by it. Ecuador's courts rejected Chevron's claim in this regard at every turn. So has an international investor arbitration panel convened by Chevron. Again, this is an opportunity for Chevron to buy time. In a contest between Kaplan's judicial imperialism v. Ecuador's Supreme Court, we are siding with Ecuador's Supreme Court and we suspect Canada's courts will too. Of course, Chevron hopes the day where Guerra has to testify under oath in Canada will never come. The company's plan is for Canada's courts to get so bogged down in the minutia of Ecuadorian law and procedure that the merits of Chevron's horrific contamination in the rainforest and fraudulent cover-up will never see the light of day. The goal is for the lawyers for the villagers to run out of funds before Guerra's bluff is called under oath before a neutral judge. Canada's courts should be careful not to become complicit in Chevron's attempts to use the country's judicial resources to continue its abusive global demonization campaign. After waiting for 22 years, Ecuador's citizens deserve a final ruling on the merits as soon as possible.